A few years ago we started remodeling our family country house. We love it because it has been with our family for more than fifty years. My grandfather changed its original usage as stable and turned it into a villa. My parents later gave it a neat and cozy look with the modern comforts. After the remodeling we moved in from Siena and made it our permanent home. Soon we realized that it was too big for us, so we decided to host people who want to spend a vacation in a nice and quiet place. We are in the Chianti region, in the heart of Tuscany, around the corner from Siena and very close to Florence, the coast, the beach and many other famous towns like S. Gimignano, Pisa. The house was originally built with stones coming from archeological sites of the Etruscan people, the first civilization of the region, older than the Romans: Mauro will be happy to take you to the Etruscan museum established by him and other archeologists. 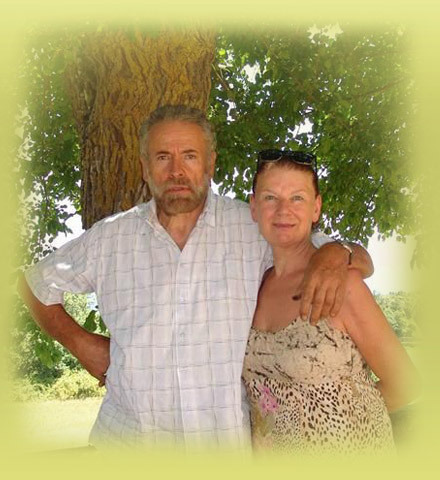 Vera, his wife, will be proud to share with you all her expertise in authentic Tuscan cuisine and her knowledge of officinal herbs. They will also be happy to give recommendations about interesting itineraries across the history, the culture and Italian wonders. The whole thing tossed with extra virgin olive oil of our production and Chianti wine. We will welcome you in a family atmosphere with warm hearts, loving care and simplicity.